Paul is an ex-octopus. RIP football’s greatest psychic mollusc, nay, football’s only psychic mollusc. 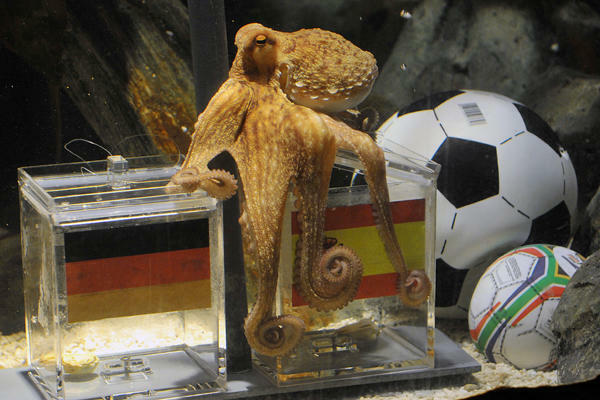 Yes, Il Pulpo Paul, who correctly ‘predicted’ (rolls eyes) a stack of World Cup results this summer, has passed away (according to a spokesperson at his aquarium) – insert your lame “He didn’t see that coming…” gags here. Mahmoud Ahmadinejad must be delighted with this news. So that’s the hot football story of the day. Check. You can stick your Ballon d’Or shortlist up your arse, frankly. It’s a lie, Pulpo Paul is alive! Uh ! Is it real ? It’s sad when a beautiful creature dies. I guess he didn’t see that coming. He’s Alive!! no wait he really is dead. i wore all black today because of this. national tragedy. Paul is the legend. Of course he couldn’t predict results, but still it is a good story. This proves that no matter how smart you are and how much do you know stuff about football, at the end – it’s mostly luck in question.